Last Sunday I had retinal eye surgery. Below is the post that I wrote just before leaving for the hospital. NIH A.D.A.M. Encyclopedia. Click for larger version. I am about to be on my way to the hospital for urgent eye surgery. A few months ago I wrote about eye and retina health after reading an article and remembering my retinal tear that was repaired with laser surgery. That post has links to reliable sources of information about retina problems. After my retinal laser surgery I was told by my doctor to keep close track of the flashes and floaters in my eye. I have, going back to the ophthalmologist several times, when I felt the situation had changed. Each time the situation was stable. But I knew that given my age and nearsightedness, I needed to keep track. Two days ago I began to see something that I did not expect. Instead of flashes and floaters, a black shadow came out of the top right corner of my left eye and then disappeared. It did not look like a curtain and did not look like a flash. Over 24 hours it got worse, so I called the doctor late on Saturday afternoon. He met me at his office half-an-hour later. I have a detached retina, and he scheduled surgery for the next morning — Sunday. This condition requires urgent medical treatment. I was watching too much for floaters and flashes and not enough for shadows so I am fortunate that no extreme damage occurred. 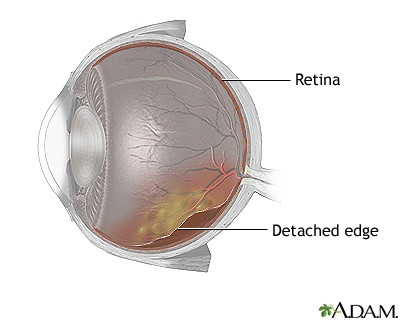 Detached retinas are serious and can lead to blindness. Aging children over 40 years old have a greater chance experiencing retina problems — just as their parents do. Nearsightedness adds risk. I will be uploading a few more posts about this process. Stay tuned. This post is not a substitute for talking with your physician. Check out all of my detached retina posts.